After the noble bodhisattva Asanga performed the practice of Lord Maitreya for twelve human years, he met Maitreya face-to-face and was led to the heavenly realm of Tushita. Maitreya presented Asanga with five commentaries that comment upon the wisdom intent of all the words of the Victorious One. These five treatises are the Two Ornaments, the Two Treatises That Distinguish, and the Sublime Continuum. 1. The Ornament of Clear Realization (Skt. Abhisamayālaṃkāra; Tib. མངོན་པར་རྟོགས་པའི་རྒྱན་, ngönpar tokpé gyen, Wyl. mngon par rtogs pa'i rgyan; Trad. Chin. 現觀莊嚴論). 2. The Ornament of the Mahayana Sutras (Skt. Māhayānasūtrālaṃkāra; Tib. ཐེག་པ་ཆེན་པོའི་མདོ་སྡེ་རྒྱན་, tekpa chenpö do de gyen, Wyl. theg pa chen po'i mdo sde rgyan; Trad. Chin. 大乘莊嚴經論). 3. Distinguishing the Middle from the Extremes (Skt. Madhyāntavibhāga; Tib. དབུས་དང་མཐའ་རྣམ་པར་འབྱེད་པ་, ü dang ta nampar jepa, Wyl. dbus dang mtha' rnam par 'byed pa; Trad. Chin. 辨中邊論頌). 4. Distinguishing Dharma and Dharmata (Skt. 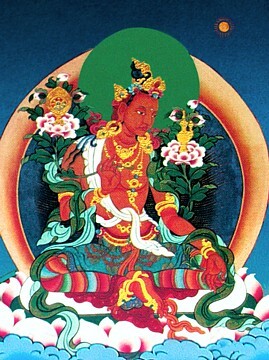 Dharma-dharmatā-vibhāga; Tib. ཆོས་དང་ཆོས་ཉིད་རྣམ་པར་འབྱེད་པ་, chö dang chönyi nampar jepa, Wyl. chos dang chos nyid rnam par 'byed pa; Trad. Chin. 辨法法性論) is very brief and direct in its presentation and is included within the class of oral instructions. 5. The Sublime Continuum (Skt. Uttaratantra Śāstra; Tib. རྒྱུད་བླ་མ་, gyü lama, Wyl. rgyud bla ma; Trad. Chin. 分別寶性大乘無上續論). The Sublime Continuum, which explains the intent of the sutras teaching the inconceivable nature of reality (dharmata). The Sublime Continuum was composed for those to be trained through the teachings on the mahayana Prasangika system." ↑ At the very beginning of his commentary on Distinguishing the Middle from the Extremes. This page was last edited on 30 December 2017, at 14:45.